August 28th marks the 53rd anniversary of the March on Washington for Jobs and Freedom. We recognize this march as a major stepping-stone towards securing the landmark Civil Rights Act of 1965 and Voting Rights Act of 1965, as well as the platform from which Martin Luther King Jr. delivered his legendary “I Have a Dream” speech. Presented in front of 250,000 marchers and broadcasted live to thousands more on television, King cemented this moment in history with his vision for equality and freedom in the United States. 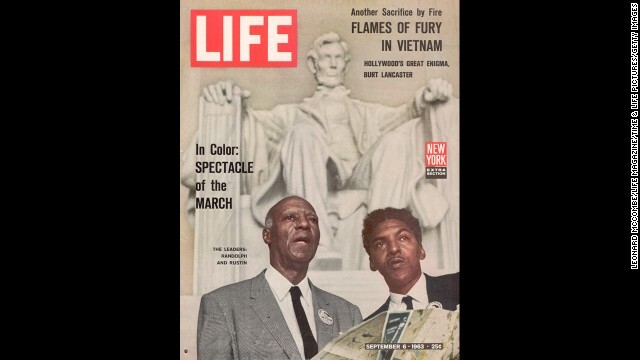 Standing behind King was one of his most trusted and influential advisors, Bayard Rustin, the Deputy Director of the march. It was Rustin who, at that point, undertook the mountainous task of coordinating the largest nonviolent demonstration in American history. A master strategist, organizer and activist, Rustin remains one of the most influential human rights leaders the world has ever seen. He dedicated his life to peace and justice, and worked tirelessly for progressive reformation until he died. Also credited with convincing King to adopt Gandhian principles and nonviolent strategies, Rustin, without a doubt, played one of the most significant roles in our nation’s history. Yet, when we speakof this day or of the civil rights movement, he is often overlooked and unmentioned. The omission is intentional because in an era of a largely closeted LGBT community, he was openly and boldly gay. He was fearless in his pursuit of living with integrity and refused to compromise who he was as a human being. Rustin’s courage to be uniquely and unapologetically him was one of his most admirable qualities. As a result of such “No Promo Homo” bills and laws, the LGBT community is stigmatized in K-12 public school classrooms. According to GLSEN, these regulations ban teachers from “discussing gay and transgender issues in a positive light.” Consequently, this can lead to teachers choosing to stray away from LGBT topics and people altogether in their curriculum in order to avoid violating the policy. Currently, eight states carry No Promo Homo laws with Arizona being one of them. In hearing this, I couldn’t help but draw parallels to 1984 by George Orwell. The off-cited author argued that those “who controls the past controls the future,” and that those “who controls the present controls the past.” One of the more troubling aspects of that “dystopian” world is the notion that those in power, often the oppressors, would rewrite history in their image, thus creating a convenient and jaundiced narrative of everything and everyone that challenges their power and perceptions. Laws like the aforementioned reveal that Orwell’s dystopian views are, in fact, our present reality. The intentional marginalization of Rustin is reminiscent of our inclination to portray historical actualities, such as broken treaties and genocidal acts against Native Americans, Japanese internment, and the infamous Bracero Program and Zuit Suit Riot of the World War II era, as fable rather than fact. Rustin’s on going historical isolation reflects both the informal and institutionalized cleansing of that and those which undermine the angelic narrative of the ruling class’ war against the reality of their divisive and nefarious acts. The absence of Rustin’s leadership in our history and consciousness reveals a clear and present danger to the past and present humanity of those the dominant society deems deviant and subordinate. In other words, our social and political institutions perpetuate varying “isms” and “phobias,” and strategically conceal past and current wrongdoings for the purpose of upholding systems that directly benefit them and their progeny. My frustration and anger comes from knowing that others, like myself, were robbed of having Rustin as a role model for so many years. To this day, many don’t know who this phenomenal individual was. This is among the many consequences of cultural incompetence and failed leadership. We are depriving ourselves, and future generations, of knowing inspiring and instructive models of trailblazing leadership, which moved millions to be better than they might otherwise have been. Rustin shouldn’t be hidden, his work on behalf of civil and human rights for all should be recognized, celebrated, and emulated. He believed, “we need in every community a group of angelic troublemakers.” As a white, heterosexual, female, I commit myself to using my privilege to speak out against injustice and stand beside historically (and currently) excluded groups as we push for equality and equity. As educators, policymakers, consultants, activists, and human beings, we must do more for one another. We must disrupt the status quo and serve as the “angelic troublemakers” this world so desperately needs. Michelle Dew is a Senior Advisor and Trainer for Diamond Strategies, LLC, a diversity, equity, and cultural competency firm that inspires, achieves, and celebrates inclusion, and an award-winning diversity and inclusion expert, community engagement leader, and conflict resolution specialist. Her work can be followed at @dstrategiesllc.